I received a deluxe sample of the new Josie Maran Vibrancy Argan Oil Foundation Fluid with a recent Sephora.com order. I chose this sample (with a promo code) because, frankly, the packaging looked pretty! 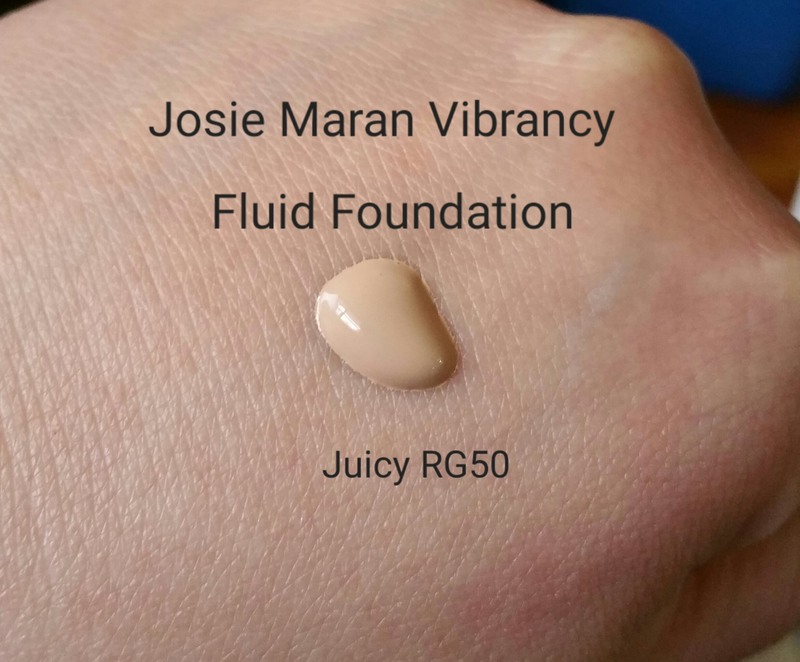 Josie Maran Argan Oil Foundation Fluid Ingredients: Coconut Alkanes**, Coco-Caprylate/Caprate**, Polyhydroxystearic Acid**, Dimethicone, Aloe Barbadensis (Aloe Vera) Leaf Juice**, Dimethicone/Vinyl Dimethicone Crosspolymer, Cetearyl Isononanoate, Disteardimonium Hectorite**, Trimethylsiloxysilicate, Argania Spinosa (Argan) Kernel Oil*, Polyglyceryl-3 Polyricinoleate**, Polyglyceryl-3 Diisostearate**, Lecithin**, Polyglyceryl-6 Polyricinoleate**, Polyglyceryl-2 Isostearate**, Shea Butter Ethyl Esters**, Tocopherol**, Silica, Triethoxycaprylylsilane, Zingiber Officinale (Ginger) Root Extract**, Epilobium Angustifolium Flower/Leaf/Stem Extract**, Hexyldecanol, Bisabolol, Cetylhydroxyproline Palmitamide, Stearic Acid**, Brassica Campestris (Rapeseed) Sterols**, Vaccinium Angustifolium (Blueberry) Fruit Extract**, Squalane**, Caprylic/Capric Triglyceride**, Behenyl Behenate**, Tribehenin, Glycerin**, Glyceryl Caprylate**. May Contain: Titanium Dioxide (CI 77891), Iron Oxides (CI 77491, CI 77492, CI 77499). This foundation is meant to give medium to full coverage. I am already satisfied with my tinted moisturizer and cover-up routine, so I don’t plan to buy this. Plus, this foundation felt way too thick and suffocating on my skin for me to ever wear. I cannot even imagine having this on my face in the summer. It feels thick and “humid” on my skin — like it never dries. In spite of that, for the right person, I feel as though this really is a “healthy”or “treatment” foundation if I’ve ever encountered one. I say this because the ingredients are consistent with an actual face cream/ moisturizer. Just testing this out and reading the ingredients made me remember why I used to love Josie Maran products. Over the years I’ve become less and less excited by her products, and by now have stopped buying them. But in the beginning, Josie Maran was the genius embassador of the then novel argan oil. The oil really was amazing (and probably still is, but there are countless dupes out there now). I used it for everything. Josie’s argan oil really got me started on using straight oil on my face, nails, hair, in the bath, and even on my kids’ skin. But when her line expanded and branched out into makeup and I became less and less interested. Although, I did really like the Josie Maran Argan Color Sticks (but I would no longer use these– they contain either mint or menthol, which is irritating on the lips). My all-time favorite product was the Josie Maran argan balm (in a tin jar). But, I just checked on Sephora and didn’t see it product for sale anymore! What happened? Does anyone out there currently use this foundation? Tell me what you think!